A tell-all Auckland business hotels guide with tips on bars, foaming micro-breweries, fine dining and shopping. We’ll tackle the sheep later. AUCKLANDERS are boating people and coffee connoisseurs, as newcomers to this increasingly cosmopolitan city (home to at least 181 ethnic groups from all corners of the globe) quickly catch on. Locals might suggest doing coffee some time or (if you meet the right people) refreshingly promise that they’ll “have you out on my boat one day”. Considering Auckland sits astride three harbours – the Waitemata, Kaipara and Manukau – as well as the fact that the city has the highest boat ownership per capita in the Western world, almost everyone it seems has some kind of association with water-based activity. It is easy to see, therefore, why Auckland, New Zealand’s biggest metropolis by far and home to 1.5 million of the country’s 4.4 million people, styles itself as the “city of sails”. While its famed harbours are dotted with boats on a good day, the vast Westhaven Marina, with berths for 800 craft, is gridlocked with vessels ranging from rusty aluminium runabouts to swish ocean-going yachts when the weather is bad. Auckland is the world's largest Polynesian city. Maori, New Zealand’s indigenous people, are Polynesian – but the city is also the adopted home of large numbers of immigrants from the small, independent South Pacific island nations dotting its backyard. New Zealand’s Asian population is also rising steadily (about one in eight people) and Hindi is the fourth most common language in New Zealand after English, Maori, and Samoan. Another refreshing feature of the “land of the long white cloud” (the translation of its Maori name, Aotearoa) is its powerful women. Women are prominent in politics, business, government agencies and the judiciary. To their credit, the guys aren’t fazed, often joking that they enjoy their freedom to play or watch rugby, a national passion. My guess is that a good many are out fishing. Nationals of many countries may enter New Zealand visa-free for holidays or business trips of less than three months (visit www.immigration.govt.nz to check), and Air New Zealand (www.airnewzealand.com) is among the many airlines operating flights between Auckland and a range of Asian and US cities. Auckland is a year-round destination, but pack warm clothes and a raincoat if you visit in winter – it gets chilly and wet. Weather is a big conversation topic, perhaps because of its fickle and unpredictable nature (and because so much of New Zealand’s agriculture industry is aligned to the weather). Come prepared for rain whatever time of year you visit. Oh, and don’t forget: dump those apples. Fresh fruit and vegetables aren’t allowed into New Zealand, and all foodstuffs must be declared for inspection. In addition to the Customs and Immigration counters, there is a thorough Agriculture and Quarantine checkpoint with x-rays. Heavy penalties can be imposed for ignoring the law. There are bins where you can dump fruit and other taboo items just before you reach the checkpoint. When it comes to changing money, rates in Auckland vary little, but banks (which have kiosks in the arrivals hall) are your best option. Avoid changing money at hotels. Well, on with our Auckland business hotel review and city guide. 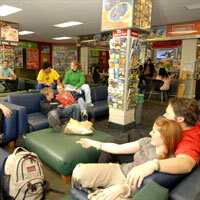 Auckland International Airport (tel: [64-9] 256-8899, www.auckland-airport.co.nz) is 21km southwest of the city. You’ll find public transport just outside the international and domestic arrivals terminals (use the free shuttle buses or clearly marked walkway between terminals). Metered taxis to city and inner-suburban hotels are NZ$60-$70 (US$1 = NZ$1.22), door-to-door shuttles (shared minibuses, www.supershuttle.co.nz) are NZ$29 per person and Airbus (tel: 0508 AIRBUS within New Zealand, www.airbus.co.nz) is NZ$16 per person with drop-offs and pick-ups at hotels. Around the city, taxis are easiest but can be expensive (NZ$10 to NZ$30 to most places of interest). Following taxi industry deregulation, numerous companies compete for business, with slight differences in metered fares (but generally not worth fussing about). Call or hail a cab, or go to one of the city’s many taxi stands. Corporate Cabs (tel: 377-0773, www.corporatecabs.co.nz) is a reliable company that may be a little more expensive than competitors but has latest-model vehicles and drivers in spiffy uniforms. Alert Taxis (tel: 309-2000) and Auckland Co-op Taxis (tel: 300-3000) are also reliable. Public buses are handy and you can plan your route on the Auckland Transport website (www.maxx.co.nz). A convenient bus loop, the Link, runs clockwise and anti-clockwise (NZ$0.50), also stopping on Queen Street and encompassing key nearby suburbs such as Parnell, Ponsonby and Newmarket as well as the newly developed Wynyard Quarter. The Auckland train system is slowly being improved. Trains depart from the shiny Britomart Transport Centre at the bottom of Queen Street in the CBD to the south, east and western suburbs of the city. Ferries run regularly from downtown (the bottom of Queen Street) to the quaint suburb of Devonport, vineyard-filled Waiheke Island and other islands that sit prettily in the Waitemata Harbour (www.fullers.co.nz). 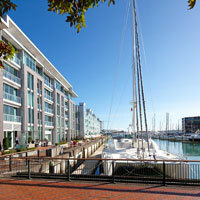 There is a good mix of Auckland business hotels, leisure options and bed & breakfast hideaways to choose from. The ultimate indulgence among Auckland hotels sits little more than five minutes by cab from the city in St Mary’s Bay, a short walk from buzzing Ponsonby. Mollies, one of Auckland’s most expensive properties, consists of transformed gabled Victorian timber mansions, with large guestrooms combining country-house cosiness with state-of-the-art modernity (there’s no extra charge for WiFi and there are blue-tooth capable sound systems in suites). The ten suites have king-size beds, fresh cut flowers, curated art from the Mollies collection, and some have fireplaces and private terraces. Guests read in quiet corners or in a garden lush with greenery and there is a spa on the top floor. An ala carte breakfast with an emphasis on fresh local produce is included in the room rate. Also in a refurbished and tastefully extended historic timber house is Great Ponsonby Art Hotel, which also meets five-star standards, but with rates considerably more modest than Mollies’. The emphasis here is on art and the environment and Pacific creations adorn the walls of the eleven rooms. If you prefer a B&B with a seaside feel, try Peace and Plenty Inn, a basic Victorian bed and breakfast located in the North Shore suburb of Devonport, a 10-minute ferry ride across the harbour from the CBD. There are seven rooms with plenty of floral views and looks at sea. High tea is served (for a price) on weekends. Top of the pile among Auckland business hotels in the city is the understated but elegant Sofitel Auckland Viaduct Harbour, which opened mid 2012 and is located right on the water in a quiet harbourside spot where boats bob quietly alongside and workers from nearby offices drop in for business meetings. The beauty of Sofitel is in its simplicity. The lobby takes full advantage of the hotel’s harbour location. There are various nooks to sit and chat, all with glimpses of water, light and sky. Rooms are fresh and elegant – some look out to the harbour, while others have views of the central atrium. All are a decent size and have floor to ceiling windows and private balconies. Rooms come with complimentary WiFi, iPod dock and Bose speakers, Sofitel’s signature MyBed, nightly turn down service (which may include chocolates or even a souvenir sheep), laptop-sized safe, and roomy bathrooms with separate rain shower and bathtub. Dine harbourside at the hotel’s restaurant, Lava, or take a tipple in Sabrage, where you can try your hand at ‘sabrage’, the art of opening a champagne bottle with a saber. If it is relaxation you require, the SO Spa is just the spot to unwind. Treatments use French cosmetology with a Kiwi touch – try the greenstone massage or Waitemata hydration journey. The Sofitel Auckland Viaduct Harbour is for the discerning traveller looking for quality, taste and understated elegance. The brand also has plans for a new property in the Britomart precinct in the future. Another of the best business and leisure hotels is the dazzlingly white Hilton, jutting 300m into the harbour on Princes Wharf and resembling a moored cruise liner. On the edge of a sail-studded harbour, the Hilton’s perch is alongside the Viaduct Basin and the newer Wynyard Quarter, both dripping with restaurants and bars. 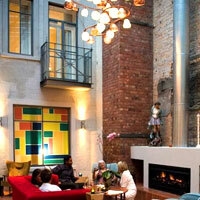 It is only five minutes’ stroll from Queen Street and Britomart’s shopping and restaurants. The Hilton’s 158 clean-lined rooms and suites are big, with balconies opening onto harbour views (or directly into the cabin of a cruise ship if you are unlucky enough to visit at the same time). In-room safes are roomy and business services feature the latest gadgetry. Rates are higher than at some other Auckland five-stars because of its unequalled location. A drink at Bellini, the casual bar-restaurant overlooking the water, is de rigueur. It offers one of the city's best panoramas and excellent cocktails. FISH is a bistro-style eatery that does wonders with fresh New Zealand produce. Work off excess calories in the outdoor lap pool at the harbour’s edge. Boutique Hotel DeBrett is located at the bottom of High Street, a lively part of the central city just off Queen Street and is less run of the mill, more arty, more popping than the average chain hotel option. Each room (of which there are 25 including 15 suites) has an individualised configuration, retro furniture, an eclectic mix of antiques and New Zealand art. There is complimentary WiFi throughout, a drawing room, a DVD and book library, and meeting rooms. DeBretts Kitchen, Housebar and Cornerbar are popular with inner city workers winding down on a Friday night. On Albert Street is the Stamford Plaza (a former Regent hotel). Former US President Bill Clinton stayed here once upon a time, perhaps when Auckland offered less options in the way of president-worthy accommodation. Light browns and whites dominate. Crisp damask linen, large desks and all expected business amenities are standard. The Stamford Plaza’s bars and restaurants have seen numerous reincarnations and presently offer casual dining in Knights on Albert and Japanese cuisine at Kabuki Teppanyaki. Farther up Albert Street is another business hotel, the Crowne Plaza, a steel and glass finger with accommodation starting on the 16th floor. Like other leading Auckland properties, it has club levels on upper floors with the usual breakfasts, cocktails and Internet access. The hotel sits above the previously upscale Atrium on Elliott mall, which is now a mishmash of Japanese cosmetic shops, nail bars, and a cheap food hall. 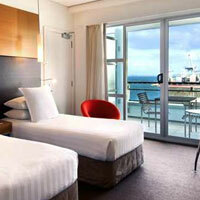 Rooms at the Crowne are spacious with good views of the city, harbour and parkland. It is popular with tour groups and also has sizeable conference and MICE facilities. The Metropolis is also surrounded by upscale shopping, and close to the Vulcan Lane/High Street pocket of fashion boutiques, quirky bars and alfresco coffee shops. There are studios and one and two-bedroom apartments, all spacious and featuring natural timber and marble surfaces. Business services are on tap, and there’s a better-than-most gymnasium and 22-metre indoor heated lap pool. Offering the usual hotel services, restaurants and bars, the Metropolis is a good alternative to a hotel, particularly for long-stay visitors. Also in the city centre, SkyCity Hotel and SkyCity Grand Hotel are four and five-star properties respectively, adjoining Auckland’s SkyCity casino. The former is plainer, with plenty of pastel yellows and blues and good views. The latter has better-appointed bathrooms and stylish timber veneers. Some rooms in SkyCity Grand have been revamped into a more modern design using natural materials – the full room renovation plan will be completed by April 2014. Rooms are spacious, and lighting and colours are calm. There is granite in the updated bathrooms and specially commissioned art on the walls. All the expected amenities are here including in-room safes, ergonomically designed work desk, and an added bonus of lovely views. Look out for the Premium Luxury rooms. Sometimes, when conventions soak up most rooms at SkyCity, the SkyCity Grand can be the less expensive of the two despite its higher status. It’s worth checking. SkyCity has a couple of the better Auckland restaurants (Masu and The Sugar Club) within its confines and also lays claim to the excellent Federal Street Dining Precinct alongside the hotel. Grander places exist, but the four-star Mercure Auckland on the corner of Queen and Customs Streets is a personal favourite. High-quality rooms with harbour views are enhanced by the hotel’s three giant pluses: location, location, location. Guests are both business and leisure travellers. You can’t get more central than this. The minimalist but very comfortably rooftop Attica bar and Vue restaurant feature splendid harbour vistas. Go for a sunset cocktail. Pullman Auckland Hotel and Residences (previously Hyatt Regency) is a 267-room property set atop a hill near the leafy surrounds of the University of Auckland. The walk to downtown takes just a few minutes, but if you don’t fancy the hike back, it’s just a short cab ride. The hotel’s busy bars and restaurants attract both locals and visitors. Guest rooms are spacious (and come with an increasingly rare feature: windows that open). Views are of the harbour, city and campus. The conference and events facilities can cater to around 1,000 delegates and venues range from grand ballrooms to more intimate meeting space. There is complimentary WiFi throughout. Take time to unwind in the spa and health club, which has a 25m heated lap pool (with retractable roof), steam room, Jacuzzi, gym and six treatment rooms. 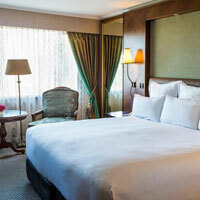 The Langham Auckland is considered a top Auckland business hotel after a recent multi-million-dollar upgrade. It backs onto Karangahape Road, a lively after-hours zone. Stroll downhill to the city centre - you may not want to walk back but there is a complimentary shuttle bus. Pastel shades and white dominate light and airy rooms that come with internet, generous-sized business desk, safe, and tea and coffee making facilities. Eight at The Langham, the signature restaurant can be recommended for a holiday splurge if you’re too lazy to leave the hotel – and is also ideal for a business huddle as tables are well spaced. Order from a long list of the best New Zealand wines from adjoining The Winery bar. Tiffin afternoon tea is served daily and is popular with Auckland ladies. There are excellent health and fitness facilities, including a heated rooftop pool and Langham’s signature Chuan Spa. The newly opened Chandelier is the Langham’s most recent addition and is a fancy event room for corporate and special events. The Langham is well set up for business travellers with sizable conference facilities, business centre and meeting rooms. A good pick for small corporate meetings or something bigger. The Rendezvous Grand Hotel is an imposing address with more than 400 rooms, making it one of the biggest hotels in Auckland. Apart from a strong convention trade, it also attracts loyal leisure and business custom. Its imposing lobby is at the base of a soaring atrium. Rooms are well appointed with floor to ceiling windows, and are part of an extensive refurbishment that has been in progress since 2012. There are three restaurants and bars to choose from including Katsura for Japanese teppanyaki. The Japanese theme extends to the Japanese rooftop pool deck and indoor pool. There is free WiFi throughout and the hotel claims to have some of the cheaper mini-bar, laundry and long-distance call rates in town. The nearby Amora Hotel Auckland, though smaller, is similar and bridges the five-star serviced apartment and boutique hotel categories. Most rooms face expanses of parkland, some have views of the Sky Tower. Full-length mirrors abound. Feeling domestic? All rooms have washers and dryers, ironing boards and kitchenettes. Dine at The Grill restaurant or al fresco by the pool. In the same league is the centrally located Heritage. In some public areas, ornately patterned ceilings have been restored and preserved and there are expanses of beautifully polished wooden floors. There are two distinctive wings; the older hotel side which retains the 1920s heritage factor and the newer tower, offering larger more modern rooms. Tower rooms are suited to long stays – some have full kitchens. WiFi is offered throughout the hotel. In addition to bars and restaurants (one of which serves healthy vegan options), the hotel has a health club, rooftop tennis court and two swimming pools (one outdoor on the roof with city and harbour views and the other a heated indoor lap pool). Also under the Heritage umbrella is the CityLife brand. CityLife Auckland is smack bang in the middle of Queen Street, so it is super convenient but Queen Street can get fairly raucous at night. Refurbished rooms are smart, and have writing desks, in-room safes, and opening ranch sliders (as well as aircon). There are no baths in the smallish bathrooms. For long-stay guests there are furnished apartments with kitchenettes. There is free WiFi in the lobby, but in room there is a cost (NZ$15 per day for 1GB). 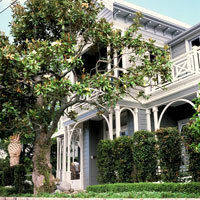 An affordable gem for holiday or business visitors is Parnell Inn, in the upmarket suburb of Parnell. This cheerily run motel (with TV, tea and coffee-making facilities and small but well appointed bathrooms) is a good bolthole and acceptable address if you want to cut costs. For backpackers, Base Auckland is – unlike some establishments in this market segment – spotless and immaculately maintained. Motel-style rooms are available if you want to splash out (on our visit these seemed particularly popular among “mature” backpackers, including a couple of blue-rinsed American women who raved about the place). The dormitories (with shared bathrooms) are filled mainly by young travellers with intention to party. (It’s a central-city location, so if it doesn’t appeal, amble along to equally noisy Fort Street, the heart of Auckland’s backpacker district, for many other options.) The “Base” – as it’s widely known – has a nightly sausage sizzle in its guests-only Balcony Bar, so those staying often eat for free in the evenings. Street-level Globe Bar is one of those party-party-party travellers’ bars with promotions drawing crowds every night of the week. Other “Base” features include fast internet access, a travel agency and an employment service. Some backpackers have been known to work the night shift on reception for cheaper accommodation. There is no one-stop shopping destination in Auckland, unless you venture farther afield to the somewhat soulless malls at Sylvia Park and Saint Lukes. There is decent shopping along Queen Street in the central city where some bigger name brands (Louis Vuitton, Gucci, Coach) have moved in, in the past few years. High Street and Vulcan Lane, (just off Queen Street) previously the hub of top NZ brands, are slowly losing their shine, but the best bookshop in Auckland (Unity Books) still resides in High Street. Britomart Precinct (www.britomart.org) is the newest development, still in the central city but nearer to the harbour. Finally urban planners have seen the value in sea views. Here you will find high-end NZ brands such as Karen Walker, Kathryn Wilson, World, Zambesi and Kate Sylvester, as well as some of the best bars and eateries in town (more on them later). There is a manicured bit of lawn where you can sit on beanbags and watch the world go by. Karangahape Road, at the top of Queen Street (the end farthest from the harbour), has an alternative edge with more eclectic boutiques and cheaper places to eat. The suburb of Ponsonby has a similar edginess without being as grungy and has some excellent cafes (Dizengoff, Bambina, Foxtrot Parlour). Check out Ponsonby Central, a food-lovers emporium with cafes and bars as well as stalls selling super fresh and excellent fish, meats, bread and organic produce. Karen Walker, World, Zambesi, Workshop, Kate Sylvester also have stores on this strip. Auckland sightseeing and must-do attractions include Auckland Museum (tel: 309-0443, www.aucklandmuseum.com) with free entry (the norm at New Zealand museums and galleries). A NZ$5 donation (or ‘koha’ in Maori) is suggested. An impressive stone edifice dominating grassy Auckland Domain, Auckland Museum also serves as a war memorial, with galleries describing New Zealanders’ role in various conflicts. It also exhibits the country’s most comprehensive collection of Maori treasures and Pacific artefacts. The Anzac Day dawn service at the museum (on 25 April at 6am) commemorates those who served in the First World War. It is affecting and emotional and draws hundreds of people every year. Auckland Art Gallery (tel: 307-7700, www.aucklandartgallery.govt.nz, free entry except for special exhibitions) houses a broad mix of colonial-era, Maori and modern works, and is worth visiting both for the art and the design on the building. If you’re travelling with kids, put Kelly Tarlton’s Sea Life Aquarium (tel: 528-0603, www.kellytarltons.co.nz) near the top of your list. For NZ$36 (adults) or NZ$18 (kids aged 15 and under), you can experience the vast aquarium and cleverly replicated “Antarctica”. There are underwater viewing tunnels, and various animal encounters are offered – notably diving with sharks. There is a range of family packages and it is worth checking the deals online, which are cheaper than walk-up prices. Sky Tower (tel: 0800 SKYCITY within New Zealand, www.skycityauckland.co.nz, open daily) is the tallest tower in the southern hemisphere and located above the Skycity casino and hotel complex. The high-speed lifts take you 328m above street level, from where views stretch 80 kilometres. (Entry from NZ$28 for adults, $11 for children between 5 and 14 and free for under-fives.) You can do a ‘sky walk’ around the pergola or get the adrenalin pumping with a base jump on wire from 192 metres up. Famed chef Peter Gordon has opened The Sugar Club on level 53 of the Sky Tower offering fine fusion dining with breathtaking views. For a view without the cost, walk up Mount Eden, another of Auckland’s extinct volcanoes. More relaxingly, a Fullers Cruises 35-minute ferry ride takes you to Waiheke Island (tel: 376-9111,www.fullers.co.nz, NZ$36 return). Arts-and-crafts villages, galleries, stunning beaches, restaurants and some of New Zealand’s best small wineries (offering vineyard tours and cellar sales) beckon. Tour options are available as you leave the ferry, as are rentals of pushbikes and cars. Rangitoto is also a decent day trip – ferries run from downtown Auckland to this volcanic island that sits quietly in the Waitemata. The walk over scoria to the summit takes about an hour. For nature lovers, Tiritiri Matangi Island is almost a must see. Birdwatchers will bask in the beauty of birdsong at this wildlife sanctuary where rare native birds flutter about the place. It is run by the Department of Conservation and is one of New Zealand’s most important conservation sites. Ferries run daily from the downtown ferry terminal to the island in summer, but be prepared to stay the day, as they don’t return until late afternoon. Remember to book ahead. Also on the water, Explorer (www.exploregroup.co.nz) offers a variety of boating activities – sailing, whale and dolphin safaris, dinner cruises and more. If you have a free half-day, head west to Piha beach. This 3km strip of iron-sand coast is best known as a surf destination, but dolphins and fur seals are often spotted and there are several good hiking trails nearby in the Waitakere Ranges. Back in the city, try the Harbour Bridge Experience (tel: 361-2000, www.ajhackett.com and www.aucklandbridgeclimb.co.nz), run by AJ Hackett, for thrills. AJ Hackett also operates bungy jumping around the country. The route up Auckland Harbour Bridge is actually no more than a steep walk along pathways with rails to which climbers are safely attached by harness. This “soft” adventure costs NZ$120, but add an extra NZ$30 if you want to bungy-jump from the bridge (you stop just above the water and are then hoisted back up). Opened in 1959, Auckland Harbour spans more than a kilometre across Waitemata Harbour and links the city to the North Shore. The North Shore has a couple of good beaches and has a different beachside feel from the central city, especially in the suburb of Takapuna. Up-and-coming destinations include Great Barrier Island in the Hauraki Gulf, a bit too far for a day trip (more remote than Waiheke island and about two hours by ferry from Auckland) but fortunately with several quality places to stay. 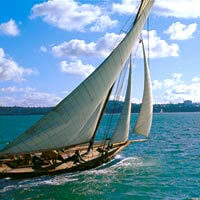 Auckland is also a starting point for sightseeing trips to the scenic Bay of Islands to its north. For immersion in Maori culture and sulphurous hot springs, visit Rotorua. For mid-winter skiing there’s the North Island’s Mt Ruapehu (about four and a half hours’ drive to Turoa from Auckland). For spectacular mountain scenery, the south island is the place to go, notably Queenstown, Wanaka, Milford Sound, and more that deserve a story of their own. After-hours, for Auckland bar and pub bustle head to Britomart, Wynyard Quarter, Ponsonby, Karangahape Road or Viaduct Basin. Each area attracts a different ‘tribe’ so explore ‘em all and see what fits. Bars come and go but there are a few that have lasted the distance. The pick of the Viaduct’s restaurants include Soul Bar (tel: 356-7249, www.soulbar.co.nz) and Euro (tel: 309-9866, www.eurobar.co.nz). There are several bars, including a couple of Irish pubs, which get fairly raucous later in the night. Further along the wharf at Wynyard Quarter, there are a fair amount of establishments to choose from, quite casual with uninterrupted views of the harbour. Try the Fish Market for a real Kiwi fish ‘n’ chips experience. In Summer on Friday nights, at the nearby Silo Park (www.silopark.co.nz) there is a night market and outdoor movie screenings projected on to a giant ‘Silo’ or tank originally used to hold concrete. Get there early for the best views, grab a beanbag and a bite at one of the excellent food trucks (pizza, takoyaki, pies, tacos, take your pick). In the opposite direction from Wynyard Quarter is the Britomart development (www.britomart.org), where there are a number of good restaurants and bars. Try Tyler Street Garage, Britomart Country Club, 1885, Ebisu (tel:300-5271, www.ebisu.co.nz), Ostro, Ortolana, Mexico, Milse and more. Enjoy the food and forget the prices. There is a nifty market on a Saturday morning for fresh pastries and other food-oriented delights. Next door to the Sky Tower is the Federal Street Dining Precinct. Depot (tel: 363-7048, www.eatatdepot.co.nz), and Federal Street Deli (www.thefed.co.nz) are standouts. About five minutes walk away on Wellesley Street is City Works Depot, an ex industrial site that now houses a smattering of popular (casual) eating spots – Best Ugly Bagel www.bestugly.co.nz), Food Truck Garage (www.foodtruckgarage.co.nz), Brothers Beer (www.brothersbeer.co.nz). Ponsonby Road also has a variety of eating and drinking establishments. For cheap and cheerful try the Ponsonby Food Court. If you wish to see and be seen try SPQR (tel: 360-1710, www.spqrnz.co.nz) or Prego (tel: 376-3095, www.prego.co.nz). More reserved environs (reservations essential) are a feature of two of Auckland’s top eateries. On Parnell Road, top Auckland dining choice Antoine’s (tel: 379-8756, www.antoinesrestaurant.co.nz), offers pan-European cuisine. The French Café in a nondescript block of upper Symonds Street in the city continues its winning formula of classic French food with a contemporary approach (tel: 377-1911, www.thefrenchcafe.co.nz). Some of the rest of the better Auckland restaurants include Meredith’s (tel: 623-3140, www.merediths.co.nz), The Engine Room (tel: 480-9502, www.engineroom.net.nz), and the aforementioned Sugar Club. The exchange rate is roughly US$1 = NZ$1.22. The IDD code for Auckland is 64-9. The hotel rates quoted below include 12.5 percent tax. More travel information is available at the Tourism New Zealand website, www.newzealand.com. An interesting website listing current music gigs in town is Mukuna (www.mukuna.co.nz). You'll find dates, music genres, locations and maps. Metro magazine is Auckland focused and has a website with all kinds of tidbits from theatre reviews to café/restaurant reviews (metromag.co.nz). Any room rates listed are for rule of thumb only. Always check on the best available internet rate or BAR. Prices will fluctuate daily and differ vastly offseason to high season. In general, room prices may range from NZ$25 at a backpacker inn to NZ$135 at a mid-range property to NZ$288 or more at better five-star establishments. Amora Hotel Auckland. 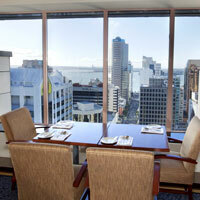 Tel: [64-9] 375-1800, fax: 375-1801, (e-mail: res@auckland.amorahotels.com or www.auckland.amorahotels.com). Metropolis Residences. Tel: [64-9] 300-8800, fax: 300-8899, (e-mail: reception@metropolisresidences.com or www.metropolisresidences.com). Base Auckland. 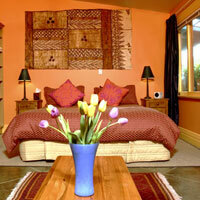 Tel: [64-9] 358-4877, fax: 359-4872, (e-mail: auckland@stayatbase.com or www.stayatbase.com). CityLife Auckland. Tel: [64-9] 379-9222, (e-mail: res.citylifeakl@heritagehotels.co.nz or www.heritagehotels.co.nz/hotels/citylife-auckland). Crowne Plaza Auckland. Tel: [64-9] 302-1111, fax: 302-3111, (e-mail: reservations@crowneplazaauckland.co.nz or www.crowneplazaauckland.co.nz). Great Ponsonby Art Hotel. Tel: [64-9] 376-5989, fax: 376-5527, (e-mail: info@greatpons.co.nz or www.greatpons.co.nz). Heritage. 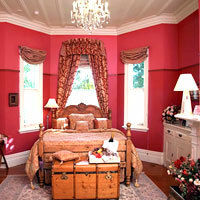 Tel: [64-9] 379-8553, fax: 379-8554, (e-mail: res@heritagehotels.co.nz or www.heritagehotels.co.nz). Hilton Auckland. Tel: [64-9] 978-2000, fax: 978-2001, (e-mail: auckland@hilton.com or www.hilton.com/en/hotels/new-zealand/hilton-auckland). Hotel DeBrett. Tel: [64-9] 925-9000, (e-mail: reservations@hoteldebrett.com or www.hoteldebrett.com). Langham Auckland. Tel: [64-9] 379-5132, fax: 377-9367, (e-mail: akl.resv@langhamhotels.com or auckland.langhamhotels.co.nz). Mercure Auckland. Tel: [64-9] 377-8920, fax: 307-3739, (e-mail: h1721-re01@accor.com or www.accorhotels.com). Mollies. Tel: [64-9] 376-3489, fax: 378-6592, (e-mail: reservations@mollies.co.nz or www.mollies.co.nz). Parnell Inn. Tel: [64-9] 358-0642, fax: 367-1032, (e-mail: info@parnellinn.co.nz or www.parnellinn.co.nz). Peace and Plenty Inn. Tel: [64-9] 445-2925, fax: 445-2901, (e-mail: peaceandplenty@xtra.co.nz or www.peaceandplenty.co.nz). Pullman Auckland Hotel and Residences. Tel: [64-9] 353-1000, fax: 353-1002, (e-mail: pullmanauckland@accor.com or www.pullmanhotels.com). Rendezvous Grand Hotel Auckland. Tel: [64-9] 366-3000, fax: 366-0121, (e-mail: reservations.auckland@rendezvoushotels.com or www.rendezvoushotels.com). Skycity Hotel. 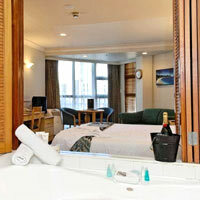 Tel: [64-9] 363-6000, 363-6010, (e-mail: hotelreservations@skycity.co.nz or www.skycityauckland.co.nz). Skycity Grand Hotel. Tel: [64-9] 363-7000, fax: 363-7010, (e-mail: grandreservations@skycity.co.nz or www.skycityauckland.co.nz). Sofitel Auckland Viaduct Harbour. Tel: [64-9] 909-9000, fax: 909-9001, (e-mail: H8577@sofitel.com or www.sofitel.com/gb/hotel-8577-sofitel-auckland). 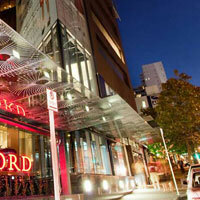 Stamford Plaza Auckland. Tel: [64-9] 309-8888, fax: 379-6445, (e-mail: sales@spak.stamford.com.au or www.stamford.com.au).